Inclusionary housing is gaining attention as a bulwark against displacement amid soaring housing costs. 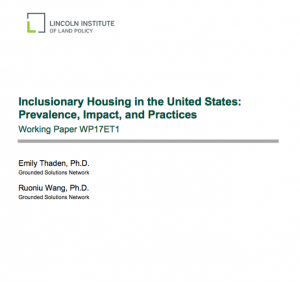 In the Working Paper Inclusionary Housing in the United States: Prevalence, Impact, and Practices, from The Lincoln Institute of Land Policy, authors Emily Thaden and Ruoniu (Vince) Wang, of Grounded Solutions Network, survey the landscape of inclusionary housing in the United States, identifying 886 jurisdictions in 25 states that have enacted the policy. The paper documents nearly 200,000 affordable housing units that have been created and nearly $2 billion in fees paid by developers in lieu of building affordable units – likely underestimates because of missing data. The paper also breaks down policies by different characteristics, including whether they are mandatory or voluntary, whether they create for-sale or rental units, and crucially, the length of time for which they require units to remain affordable. The paper finds that least 90 percent of inclusionary housing programs require that units remain affordable for 30 years or longer. 164 jurisdictions reported an additional 2,100 affordable homes.